The 5th anniversary of the Citizens United decision is a call to action. On January 21st I will be at Lafayette Park in Washington DC across the street from the US Chamber of Commerce. Many people representing many American walks of life will be there, and together we hope to bring LIGHT to the issue of DARK money. We live in a time when a powerful few, using money as speech and hiding behind corporations as people, are influencing our elected and our judiciary to support a financial agenda in pursuit of unlimited wealth. They leave a wake of social and economic injustice that, with our without intent, cripples our nation as it tears her People apart, and threatens our very existence with indifference to consequences of their actions. Standing up for The People is a job from which we cannot be laid-off or fired. It is, however, a job we can quit. I will never quit. The fate of this republic’s democracy is in my hands as it is in yours. If you have quit, tear up your resignation. If you have not quit, take heart. WE see the truth hidden by the smoke and mirrors of mindless media and disguised by overly clever use of the language of the law. WE are the spark that will light the fire that will create “liberty and justice for ALL”. The Chamber of Commerce is the country’s leader in dark money politics, having laundered over $31Million in the recent mid term elections to support candidates that become beholden to the wealth builder agenda. We need to let them know the time for dark money is over. Join us in Washington, DC. Or, join us by making a statement in your community. 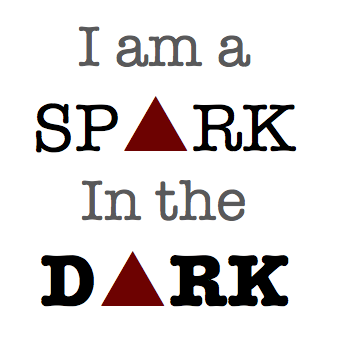 Be a spark in the dark.